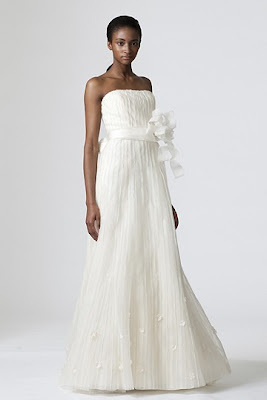 In wedding fashion, I love to use ribbons, buttons, bows and blossoms to add whimsy and eccentricity. These design elements introduce fantasy and establish an optimistic tone. 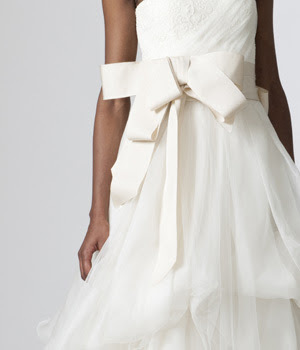 Bows add femininity and grace to any wedding dress. 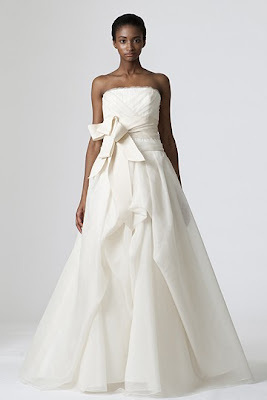 The size and placement of bows serve different purposes in wedding fashion. 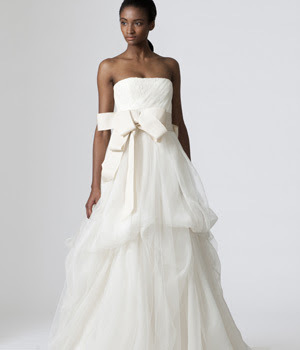 On Dinah, the large bowed sash is a more dramatic statement. 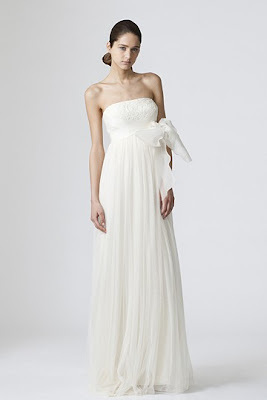 On other wedding dresses, I use small bows to cover up hooks on a bustle. This Collection celebrates a new sense of freedom and fragility. From delicate, ethereal layers to pale hand-painted tulles and silks, this collection embraces a youthful charm, femininity and romance. Ribbons, buttons, bows and blossoms add to the overall whimsy and lightness in an entirely modern take on wedding fantasy! Asymmetrical draping, random gathers and all sorts of scattered decorative touches add to the eccentricity and artistry of this collection.